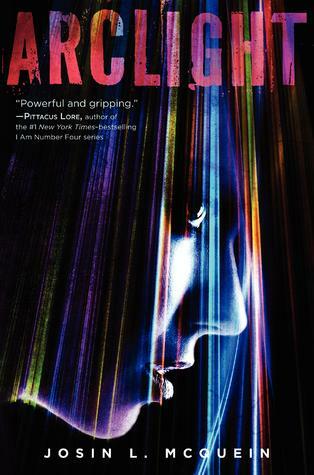 Book Review: Arclight by Josin L. McQuein - Book.Blog.Bake. When one of the Fade infiltrates the Arclight and Marina recognizes it, she will begin to unlock secrets she didn’t even know she had. Who will Marina become? Who can she never be again? Arclight was an enjoyable, if predictable, read, and I have to say I understand the buzz surrounding the book, though there were a couple of problem spots for me. One of the things that really drew me to Arclight was everyone saying it was creepy and had awesome twists. Unfortunately, I personally found neither of those claims to ring true with me. The first chapter indeed was creepy/horrifying, but it only lasted through that first chapter. The large “twist” that everyone talked about was fairly predictable, which was really my biggest issue with this book: predictability. Nothing in the plot managed to surprise me or take me off guard, and I think that created some distance between myself and the action for the majority of the book. I was invested, but just barely, and that’s how I feel about the book as a whole: I like the characters, but just barely. I liked the plot, but just barely. It’s definitely enough to tip this book onto the positive side for me, but not a book I’ll rush to read the sequels or re-read any time soon. While I found the plot predictable, that’s not to say it wasn’t well done. I found the story tightly crafted– I knew every word on each page meant something and was getting us closer to the ultimate reveal. The first chapter, the one that had the creepy part down, was a terrific opening. My impression of Marina, the main character, went back-and-forth often. At the beginning, she does some stupid things and I may or may not have been yelling at her inside my head to straighten up, but at about a quarter through I started to really click with her. Her struggle of not knowing who she is was probably my favorite thing about this novel. The Fade=awesome. I love the whole concept of the Fade and how McQuein painted such an awesome picture of the Fade on the pages. The world-building in this book isn’t lacking for description, and while I’m pretty happy with leaving this story where it was without NEEDING the sequel, the Fade might be what convinces me to pick it up if I do so. Final Impression: This book wasn’t stellar and I didn’t find it creepy/surprising like a lot of bloggers did, but I still enjoyed the read. Marina was a good main character, and McQuein’s ability to create a world was really what captured the novel for me. 3/5 cupcakes. The Sunday Wrap-up! (16) - Book.Blog.Bake. I think I could get over predictability for a concept; here’s hoping I end up enjoying the Fade idea as much as you did! Yeah, I enjoyed this book but the twist wasn’t really a twist as far as I’m concerned. I thought it was pretty obvious from the very beginning, lol.